This Lakefront 7-bedroom home is located between the Falls Beach and the Pines Village, and has its own Private Boat Dock. This large family-oriented lake front home offers 6 bedrooms and 3 baths — and has a separate 1-bedroom 1-bath apartment above the home. The beautiful covered deck area has many mature shade trees, lawn, patio area and gentle beach are a great way to enjoy the beauty and nature that is Bass Lake. 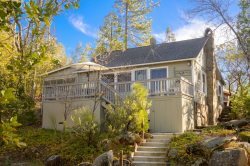 The outdoor area is very gently sloped making this classic Bass Lake cabin a perfect setting for families. The Waterfront area features trex decking and a covered private dock. You will enjoy a country style kitchen and 2 comfortable living areas, one stocked with games and a featuring a large dining table and one with access to the deck. The master suite features deck access. Maximum parking for 5 vehicles including room for boat trailers. Amenities include cable TV, WIFI, Dishwasher, Microwave, Washer and Dryer, Gas BBQ, and a ping-pong table. Added Window A/C to Master bedroom and other room upstairs. Bed Locations: 1st bedroom has 2 queens + twin, 2nd bedroom has 1 queen, 3rd bedroom has 2 singles/twins, 4th bedroom has 2 singles, 5th bedroom has a 2 singles/twins (beds are pushed together), 6th bedroom has 1 Queen. The apartment has a double bed.